Previously, he served as Chancellor of the Exchequer from 1997 to 2007, making him the longest-serving Chancellor in modern history. During ten years at the Treasury, Gordon masterminded many of Labour’s proudest achievements including the Minimum Wage, Sure Start, the Winter Fuel Allowance, the Child Trust Fund, the Child Tax Credit and paid paternity leave. His record on global justice includes his negotiation of debt cancellation for the world’s poorest nations and the tripling of the budget for life-saving aid. His time as Chancellor was also marked by major reform of Britain’s monetary and fiscal policy as well as the sustained investment in health, education and overseas aid. Gordon served as the Labour Member of Parliament for Dunfermline East (1983- 2005), and for Kirkcaldy and Cowdenbeath (2005-2015) in his home area of Fife in Scotland. He was elected as Leader of the Labour Party serving from 2007-2010. His roles in parliament and government have continued to shape his views on the importance of education as a fundamental right of every child in the world and the key to unlocking better health, greater social stability, more rights and opportunities for women and a higher standard of living. He is a passionate advocate for global action to ensure education for all. 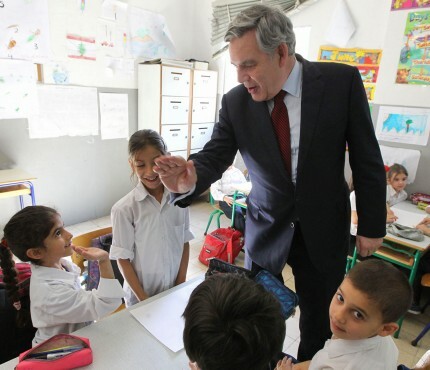 In his role as UN Special Envoy for Global Education, he works closely with key partners to help galvanise support for the new International Financing Facility for Education that proposes a groundbreaking way to finance education for every child. He is Chair of the High Level Steering Group for the Education Cannot Wait fund for education in emergencies, Chair of the Inquiry on Protecting Children in Conflict and Chair of the International Commission on Financing Global Education Opportunity. He also serves as Chair of the Advisory Board for the Catalyst Trust for Universal Education and is an Advisor to the Board of the Graça Machel Trust. In addition to his global education work Gordon is a Senior Panel Member at the Kofi Annan Foundation initiative on Electoral Integrity and is a Patron of the Burma Campaign UK. He is also an Honorary Fellow of the Royal Society of Edinburgh. Gordon is the author of several books including Beyond the Crash: Overcoming the First Crisis of Globalisation, My Scotland, Our Britain and My Life, Our Times. Gordon has a PhD in History from the University of Edinburgh and spent his early career working as a lecturer. He is married to Sarah Brown, the President of Theirworld and Chair of the Global Business Coalition for Education, and the couple live in Fife, Scotland with their two sons, John and Fraser.